I try to do the best I can for every baby and mother I see each day, so that any baby who may have a hearing loss is picked up early and can receive the treatment and support they need. I’ve been a newborn hearing screener for 2 years. I’m one of a team of screeners based at City Hospital in Birmingham, working in the maternity and neonatal units. Newborn hearing screening helps identify babies who have permanent hearing loss as early as possible. These babies and their families can then get the support and advice they need right from the start. The test just takes a few minutes. A small soft-tipped earpiece being placed in the baby’s ear and gentle clicking sounds are played. When an ear receives sound, the inner part (called the cochlea) responds. This can be picked up by the screening equipment. I usually start my daily routine by collecting the birth notifications and updating the SMART4Hearing IT system so all babies eligible for screening on that day can be identified. Next, I calibrate the screening equipment to make sure it is safe and correctly set up and I clean down the trolleys. When all babies requiring screening have been identified we distribute the workload between the staff working on the day. We always go to the midwives first to check we have the right information and that it is OK to approach the mothers. It is always useful to be aware of any infection control or social care issues. An important part of my role is to make sure all mothers understand the screening we offer. 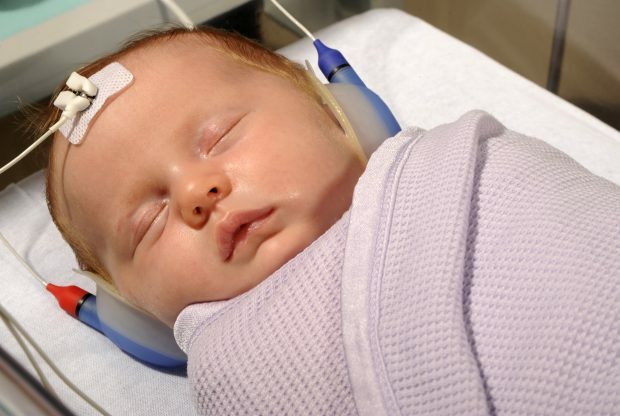 Newborn hearing screening helps identify babies who have permanent hearing loss. Doing this shortly after birth means these babies and their families can get the support and advice they need right from the start. After checking mum’s and baby’s details, I ask if there is any family history of hearing loss and if the doctor or midwife have any concerns about the baby. I explain that the baby should be settled and that the equipment will give us the results of the screening test. The result is either a clear response or no clear response. I make sure the mum understands the reasons why we may not get a clear response result and what happens if that’s the case. When I am happy that mum has understood and given her consent to the screening I continue. We try to screen babies before they leave hospital but some babies are discharged out of screening hours. We arrange clinic appointments to screen these babies. Once I have completed the test I discuss the screening results with the mother (or parents). I’ll also explain if any further tests are required. For example, some babies need ongoing surveillance and will be offered another screening test at around 8 months to a year of age. We have administrative tasks to complete each day, including downloading the results on SMaRT4Hearing, inputting data, sending patient satisfaction text surveys and arranging appointments for any outpatients or referrals. The newborn hearing screening role is different each day as I meet new parents and babies, work on the wards, the neonatal unit and in outpatient clinics.